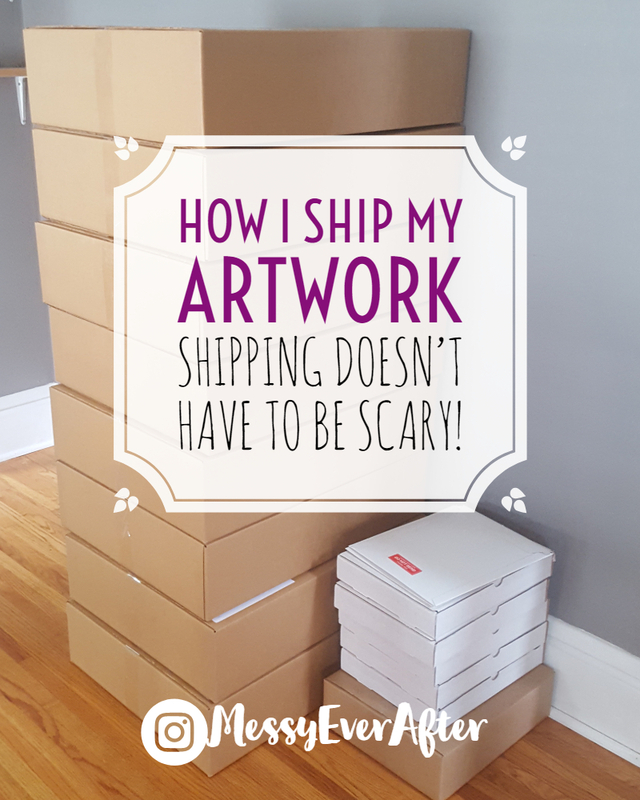 Shipping your art doesn’t have to be scary. I used to be afraid of shipping my art. There were too many variables and things that could go wrong. Should I ship internationally or just domestically? How much should I charge my customers? Where will I get my shipping materials? How much will shipping cost me? What size canvases can I ship before running into oversized charges? Which carrier do I use? Should I buy insurance? What if something goes wrong with a shipment? How do I handle returns? I’m here to tell you that shipping doesn’t have to be scary. There are a few simple things you can do to make sure artwork arrives safely and customers are happy. Here’s how I do it. You don’t need to get too fancy to get started. Let’s say you are starting to think about creating an online store, but shipping your work gives you a bit of a panic attack. My advice: Start small and start local. When I first started selling through my simple Square Up store, I only sold pieces sized between 8”x10” and 11”x14” and I only sold within the United States. Starting with the small sizes meant I could easily find boxes to fit these pieces and keep shipping prices low. I wasn’t selling more than a few pieces a month and I was very wary of investing too much money in shipping supplies when I didn’t know what I could expect over the next few months. I kept things really simple and used recycled boxes for my first few shipments. I found an Amazon box in my recycle pile that fit the largest canvas size I offered in my store, I created a sample shipment to weigh, and then I input the dimensions and weight into the USPS shipping calculator to have an idea of what the cost would be on my end. Then I factored this cost into my online store prices. Once I started to consistently have 2 to 3 sales in my store a week, I purchased a bulk bundle of boxes so I’d never have to stockpile random Amazon boxes again. Since the max canvas size I offered in my store was 11″x14″ I picked one size box that would work for all of my shipments. After a few months, I was able to start offering larger sizes and could afford to spend more money on shipping supplies up front. Make things personalized and attractive. After I receive an order in my store, I print a packing slip and the order. I inspect the items ordered and then wrap each canvas in a sheet of thin plastic. Securing the flaps with clear tape. (You can also use self sealing poly bags.) This helps protect the art from moisture and keeps anything from sticking to the surface of your art. Packing slip (if you use an app like Shippo, it will generate a slip for you from your online store. Etsy also generates packing slips. You can use an invoice as well. Just make sure there is a document with the customer’s name and address in the package in case the outside label gets damaged. Thank you card- always show gratitude when your customer buys something. You never know who will be a repeat customer. They are supporting your business and it’s important they know you appreciate it. I hand write a note with each piece I send out. Coupon/Loyalty Rewards- Give your customer a reason to shop again. I include a coupon code with each order. I cut and crinkle sheets of brown kraft paper to serve as a cushion for the bottom of the box and on top of the art. I’ve also used recycled air bags and bubble wrap from my personal shipments. Don’t use materials that can stab, puncture, or dent your art. Once the box is full, close the flaps and give the box a shake. Does the art shift and move easily? If there is a lot of movement within the box, I add more packing material. Seal the box with packing tape. Now you’re ready for your label. These are super easy to mail. Get a flat mailer. 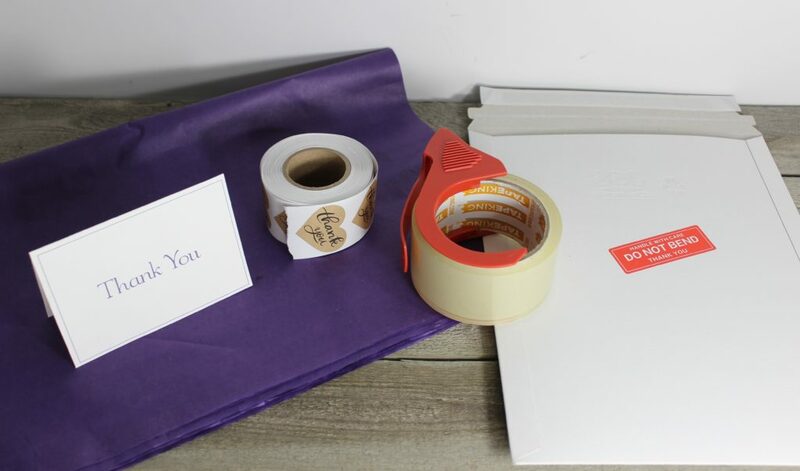 Seal your art in a poly bag. Include packing slip, thank you note, and coupon/next purchase promotion. You can also use a thin piece of cardboard to give your art more protection and rigidity during shipping. Affix shipping label and “Do Not Bend” stickers to the outside. If you work with large pieces, you may consider using shipping tubes and rolling your art. I’d recommend using a poly bag to seal your art before rolling. Once your art is packaged, it’s time to get a shipping label. There are two main options that I have used. Option One: Hand write or print the customer’s name and address on paper and affix with tape to the box. Have USPS weigh, measure, and print postage label at the post office. Option Two: Use a shipping app like Shippo. Weigh and measure the shipment, and print your own labels at home. Then, drop the package off at post office or schedule a pick up a day in advance. Option two is my preferred method. You’ll need is a kitchen scale and a tape measure for accurate shipping rates. You can even use adhesive labels to make things super easy. When I upgraded my online store to Weebly, I chose to use app integration and picked Shippo to simplify my shipping needs. At the moment, you can enter orders by hand and print a label at home if you do not have an ecommerce store that can be integrated with the platform. If you connect your Weebly store, orders will show up on your Shippo Dashboard where you can print a packing slip, and then choose shipping options. Check it out. I love it. It’s only a few cents per label, but you get access to commercial shipping rates so it’s still might be cheaper than physically going to the post office. A positive interaction with a customer during the shipping process is crucial for growing an online business. Try to ship your items within 24-48 hours of the placement of your order and ALWAYS give your customer a tracking number and carrier information. You should also write a Return Policy and include this somewhere in your store. I include a link to my policy on my receipts and order confirmations. If you plan on selling your art, it’s good practice to have a plan in place for accepting returns. Figure out your policy before to save headaches later. You may also want to consider following up with your customer once the order arrives to see how things are going. I watch all of my orders on my Shippo dashboard to make sure all packages are delivered. If the shipping status isn’t updated for a while, I reach out to the customer to verify they received their item. Packing materials: I use thick brown kraft paper like this. -Don’t immediately try to sell and ship a variety of sizes online. This means you will have to work harder at sourcing boxes to fit each sale. If you take my approach and buy a bundle of boxes that can fit one or two sizes then you can be more conservative in your investments instead of buying a crap ton of sizes that you have no guarantee of using right away. -Hoard boxes and packing material if you frequently order things online. I have a box of random supplies that I pull from for large shipments. It’s a good way to recycle AND save money. -International Sales: Your costs will be higher, transit times are longer, and your customers may have to deal with customs charges, but the USPS labels are very easy to use and Shippo fills most of the details out for you. Etsy makes international orders really easy as well. -Insurance: I personally do not insure most of my packages. If you use Priority Mail, this often includes insurance up to a certain amount. Ask yourself if you can afford to lose the entire amount of the shipment if something goes wrong and you need to refund your customer’s money. If not, insure the package. I personally haven’t dealt with something going wrong with a package yet (knock on wood), but you might want to look into your options. Also look into the insurance claim process. -Pack, measure, and weigh a sample piece of art to get accurate shipping costs before putting an item for sale online. You don’t want to be surprised by shipping charges and lose all of your profit if you assume you can ship a 36”x48” canvas safely for $30. -Always check your shipping costs for a new box size before ordering in bulk. -Try out the shipping rates with other carriers like UPS or Fedex. I found that for my smaller pieces, USPS was more cost effective. -If you only work with large pieces, consider reaching out to LTL freight companies for shipping quotes. Or you can look at taking canvas off of the stretchers and shipping the rolled canvas in a tube. But this would force customers to spend time and money on re-stretching the canvas. -Some states require you to collect sales tax on shipping charges. Check into your local sales tax laws for details. And that’s all I’ve got. This is my way of shipping artwork. I’m sure every artist does things a little differently, but as long as you ensure your art is safely packaged and can survive the aggressive journey most boxes take during the shipping process then you’re good to go. If you have any questions or comments please leave them below while commenting is open, or reach out to me directly. If you have additional shipping questions, I am happy to answer. I tried to include all of my knowledge, but I may have missed some things. As always, thanks so much for reading! Check out the rest of my posts for more artsy goodness and go get messy. Previous Previous post: Are You Stealing From Other Artists?